Hearthstone was expected to get a new expansion at BlizzCon, as it usually does. But something was different this time around. Yes, Kobolds & Catacombs will feature all-new cards, along with some new mechanics. That's still the same. No, something else is different. 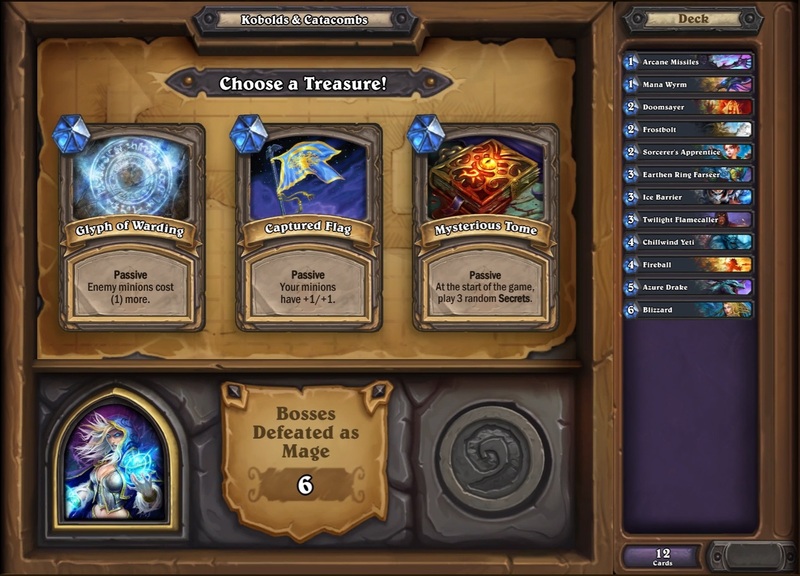 It's the new single-player content, which goes beyond the normal Hearthstone structure of taking on a handful of bosses each week. 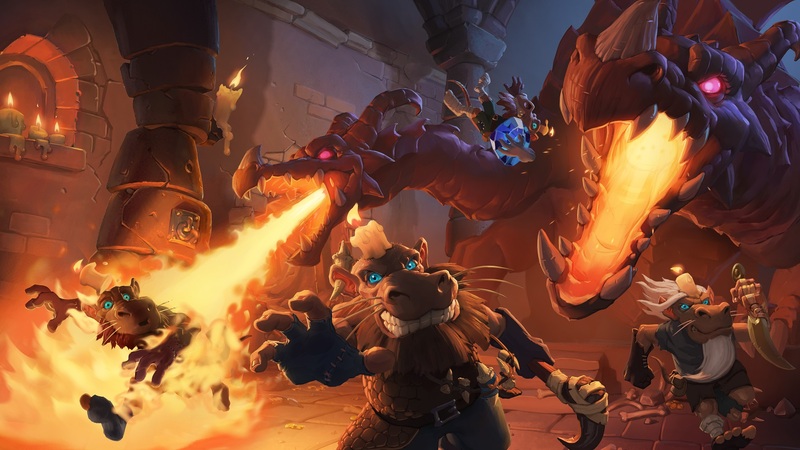 For this expansion, Hearthstone is introducing Dungeon Run, in which players take on a handful of random bosses using decks that are constructed over the course of their run. It's the first Hearthstone roguelike and Shacknews got a chance to go hands-on with this new game mode. 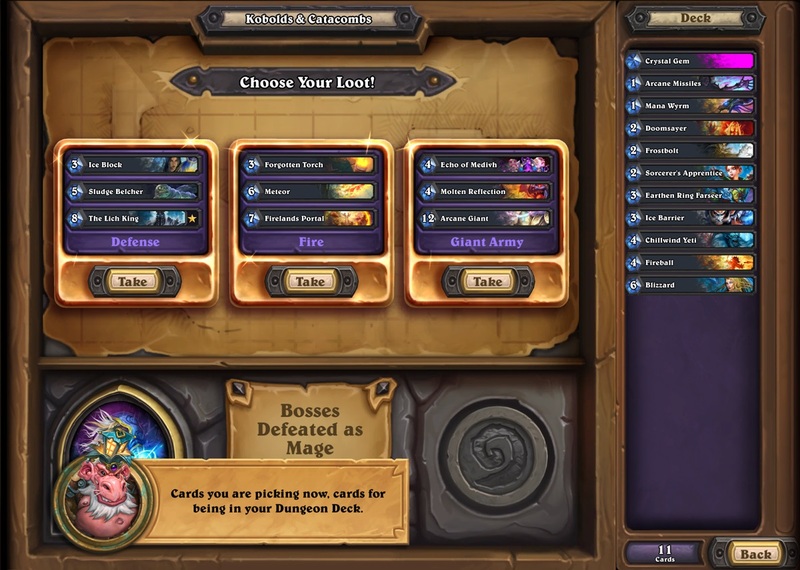 The demo station at BlizzCon had three "pre-built" decks available for Dungeon Run. And the reason "pre-built" is in quotes is because it starts out with a small handful of cards, with the player building out from there after each successful victory. The session starts off with bare bones decks and with both sides having small amounts of health. The boss difficulty, deck strengths, starting health, and abilities all intensify over the course of the session. It'll help players to be familiar with all of Hearthstone's expansions to this point, because all Wild cards will be in play. To start things off, I played as the Mage. As one would expect, the Mage's offensive spells made the first game (against a Giant Rat) a breeze, even with only 10 health. Since the boss only had 10 Health himself, it was easy to reel off a quick Fireball spell. That's one thing to note about these Dungeon Run games. They can be quick affairs and, more often than not, will end in less than ten turns. After defeating a boss, it was time to pick a passive ability. I selected the Mysterious Tome, which would place three random Secrets on the board at the start of every subsequent game. To my surprise, this effect wasn't limited to Mage Secrets. I was also getting Hunter and Paladin Secrets, which were handy against the second boss. After beating this second boss, I was given the choice of a powerful spell. I picked a card called "Wish" and pocketed it for the final boss, Blacksteed. Blacksteed was a clear indication that Dungeon Run isn't going to mess around in the later stages. Blacksteed was not only able to fill the board, but he had a 0-mana Hero Power that would evolve any of his minions. He also had some crazy board clears, like Swipe and Ultimate Infestation at his disposal. During my Mage run, I was able to use my Wish card as a last resort. This card allowed me to fill my board with Legendary minions and completely heal my hero back to 30 Health. With Sylvanas Windrunner, Soggoth the Slitherer, and Sindragosa all on the board, winning this was a breeze. Winning with the Warrior wasn't quite so easy. Blacksteed was able to find counters to many of my minions and was able to score with some lucky RNG. Skilled use of cards like Bomb Squad, along with evolving into Charge minions was enough to end my Warrior's day, which in the final release would mean I'd have to start from scratch. Part of the reason my Warrior didn't fare so well was because my deck-building had gotten sloppy and that's one of the challenges of Dungeon Run. In addition to passive and special spell card rewards, players earn their choice of additional Wild cards to add to their deck. All of them will adhere to a special synergy. For example, the Priest can pick a handful of Elementals, while the Mage can choose between burn spells or Secrets. Sticking with this synergy can lead to some powerful decks, but as with most everything Hearthstone, luck is going to be a factor, as well. Surviving the Dungeon Run not only means building a powerful deck, but also hoping that you won't bump into a particular boss that proves to be a hard counter for that deck. While Dungeon Run has proven to be plenty challenging, there are some AI hiccups that I noticed with a few of the bosses. For example, an early boss used a Bestial Wrath on a minion he had just played, essentially making it a wasted play. Later, Blacksteed used a Recycle spell on my Sindragosa, which just meant I could play it again later and enjoy the full benefit of its Battlecry. I'm hopeful these AI tics won't be common, because Dungeon Run has the potential to be intensely challenging if bosses are running on all cylinders. One other thing to note about Dungeon Run is that the rewards for completing it aren't clear. During the "Hearthstone: What's Next?" panel, however, it was noted that players would get something special for completing the game mode with all nine classes. If that reward is anything substantial, then put your thinking caps on. Dungeon Run won't be an easy ride and it's certainly a welcome challenge in Hearthstone. Look for Dungeon Run to debut with Kobolds & Catacombs sometime in December.